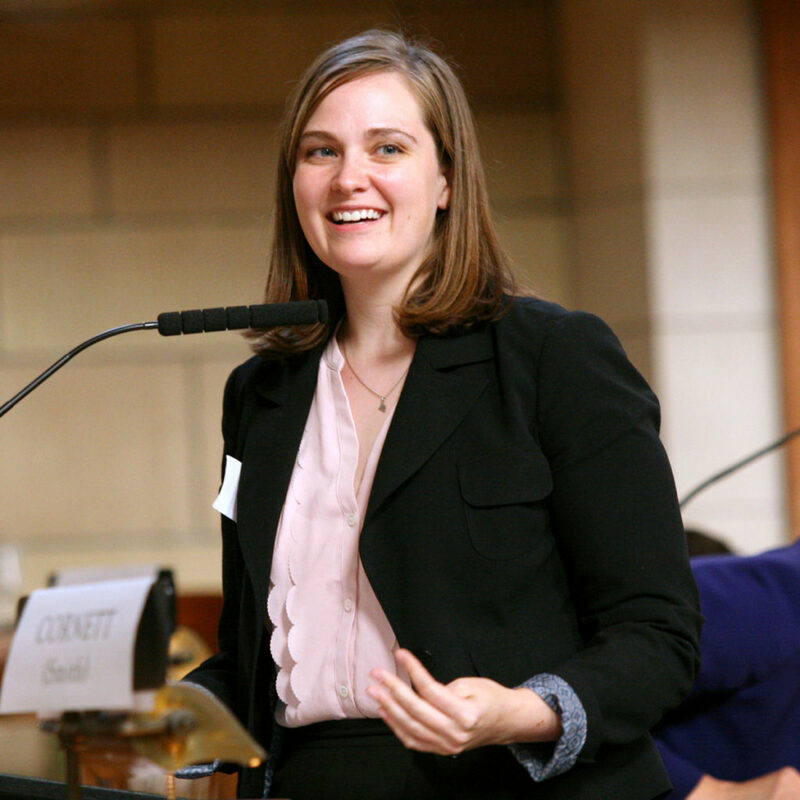 In the next installment of a series of reports profiling Omaha-area state senators, KVNO Student Reporter Emily White speaks with Senator Sara Howard of Omaha about her past legislative priorities and the importance of community and civic engagement. The Nebraska Unicameral plays an important role in many aspects of our day-to-day life—from appropriating funding for the state budget to crafting laws and policies that directly impact citizens. Moreover, this legislative body is unique in that it is the only unicameral and officially nonpartisan legislature in the country. In this segment profiling our local state senators, we’ll get to know more about Senator Sara Howard, who represents District 9, covering part of midtown Omaha. She’s the daughter of Gwen Howard, who represented the district from 2005 to 2013. One might think that family connection would make Sen. Howard a natural successor to her mother. But she says that after moving away for law school and finding a job elsewhere, running for the legislature wasn’t in her plans. It was only when she came back to Omaha that she began to consider the idea. Howard: So I actually had no intention of running for the Legislature. I started following my mom around to all these different events. And without fail, whether it was, like, a neighborhood association meeting or a union meeting or anything, people would come up to me and say, “I just wanted to introduce myself–I’m Tim and I would walk your mom’s dogs when she had late nights in the session” or “I’m Roberta and I left hot dishes for your mom on Tuesdays” or “I’m Buff and I would take your mom to church on Sunday.” To me, I could feel how much this community had taken care of my mom when I couldn’t be there, and so when I decided to run, it really wasn’t about this incredible salary–because I make 12,000 dollars a year in this job!–it was really about giving back to a community that has been remarkable, remarkable to my family. That’s what helps her keep perspective as she now serves this community as state senator. Howard: I try to keep that in mind when I do this work and I try to keep that in mind when I think about this role. My job is – I have 37,000 bosses and they don’t always agree, but I know that it’s my job to make sure that they feel job and that the things that are important to them are important to me, and that I champion them on their behalf. Sen. Howard is most proud of the work she has done to combat the opioid crisis. It hits close to home for her: her sister, Carrie, died of an overdose in 2009. Howard: I will be honest, though – the first two years, I didn’t even wanna talk about it. Like, I didn’t want to talk about opioids, I didn’t want to talk about what happened with Carrie. And by my third year, I sort of realized that if I didn’t, the state of Nebraska wasn’t going to do anything about it. Right? There were going to be more families that went through exactly what Mom and I went through. They will suffer in silence; they will feel that shame, and I didn’t want anybody to have that experience. And so I started talking about it. And I started working on policy because I’m really passionate about policy and it’s where I can do the most good. District 9 includes the University of Nebraska at Omaha campus. Sen. Howard and I spoke on how best to get young students civically engaged and out to vote. Howard: One of the things that I would want students to remember is that we just had two years of a legislature that did not support the university, that wanted to cut the university. And that means that the university has to raise money by raising tuition, and that specifically harms students. So when we think about President Bounds sending emails saying the Legislature isn’t supporting you and I’m going to have to raise tuition, it is a direct result of elections. Howard: I love policy work and I love helping people and being of service, and so whatever my next steps are, I can only hope that they involve all of those things.